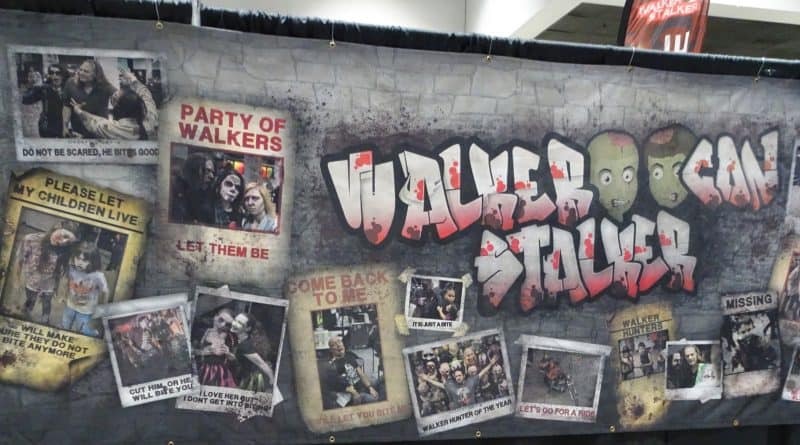 On December 1-2, 2018, Walker Stalker returned to the San Francisco Bay Area. Unlike past years, where the event was held in the spring at Fort Mason in San Francisco, this year, the con was held at the convention center in San Jose in late fall, and was combined with a Heroes & Villains Fanfest event. Overall, these changes were good ones for attendees, who especially seemed to appreciate the change in venue. In 2017, on Sunday of Walker Stalker, the weather was cold, windy and rainy, which was problematic for fans, as panels and other events were held outdoors. In 2018, the Saturday of Walker Stalker was also cold, windy and rainy, yet inside a warm convention center, no one minded. Attendees also appreciated the added space, as well as the food options that were easily available inside the building. All of the multi-year attendees who spoke to FoCC Blog felt that this venue in San Jose was much better suited to a con than Fort Mason. Another benefit of the convention center was the increased seating capacity at panels. 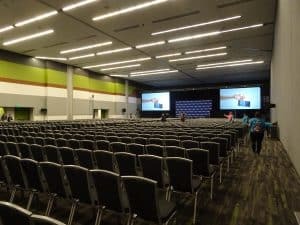 This year, there was plenty of space for all levels of attendees, and no one had to miss out on the panels they wanted to see. Fans also enjoyed the FanFest Live stage in the middle of the exhibit floor, where cosplayers had a chance to shine, and some of the celebrity guests were brought for interviews, getting up close and personal with attendees. The combining of Walker Stalker with FanFest was a surprise for most attendees, and many arrived at Will Call to pick up their badges confused by the signage. The truth is that save for a Flash panel and Stephen Amell/Arrow panels (and related celebrity guests) the vast majority of offerings related to The Walking Dead. Dozens of Walking Dead actors were available for autographs, photo ops, and panels, and fans were excited to meet the celebrities up close. 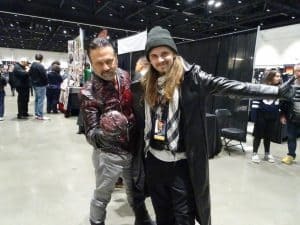 FoCC Blog spoke with many attendees for whom this event was their first-ever con, and they were thrilled to be there and see the actors from their favorite show. 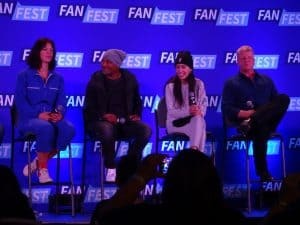 While not all of the actors present participated in panels, attendees were still able to enjoy sessions such as ‘Love Hurts’ with Pollyana McIntosh (Jadis), Seth Gilliam (Father Gabriel), Christian Serratos (Rosita) and Michael Cudlitz (Abraham) and ‘Best Buds’ with Chandler Riggs (Carl), Katelyn Nacon (Enid) and Ross Marquand (Aaron). 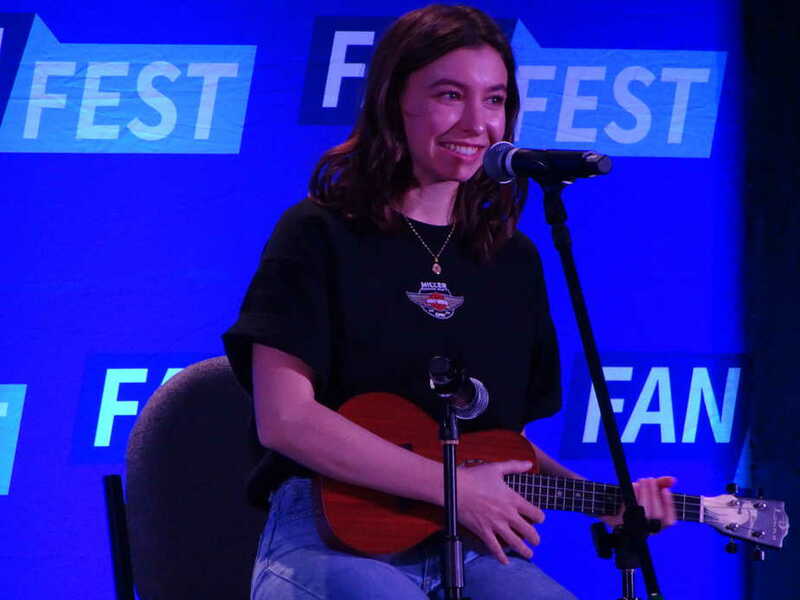 One unexpected surprise for fans was watching Katelyn Nacon, whom some may not know is a songwriter, perform on her ukulele and sing original songs (and one cover) for fans between panels on Saturday. 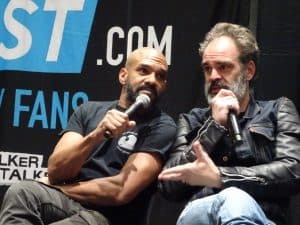 Jenna Elfman (June on Fear), Garrett Dillahunt (John Dorie on Fear), Steven Ogg (Simon), Khary Payton (King Ezekiel), David Morrissey (The Governor) and Tom Payne (Jesus) also took to the stage for panels. 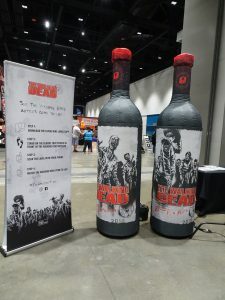 While the exhibit floor was sparse, with little in the way of unique offerings, attendees were able to spin a wheel for prizes at a mini-Warner Brothers films booth, get made up by professional artists as a walker, and learn about the Walking Dead wines. 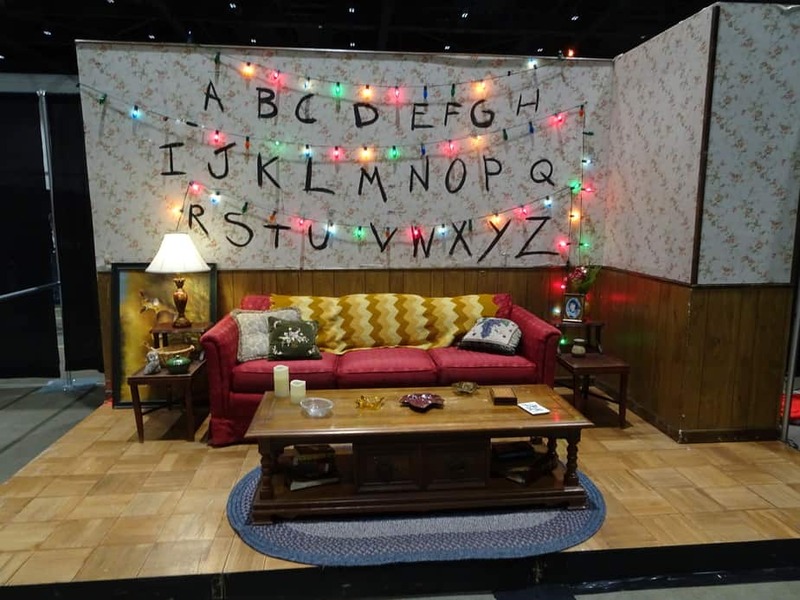 A free photo op in Will Byers’ living room (from Stranger Things) was also popular and included the infamous (and unexpectedly seasonal) Christmas lights that transmitted messages in the show. This year’s Walker Stalker was a significant improvement over the event last year in the San Francisco Bay Area. I am looking forward to seeing what next year’s event brings to the West Coast. 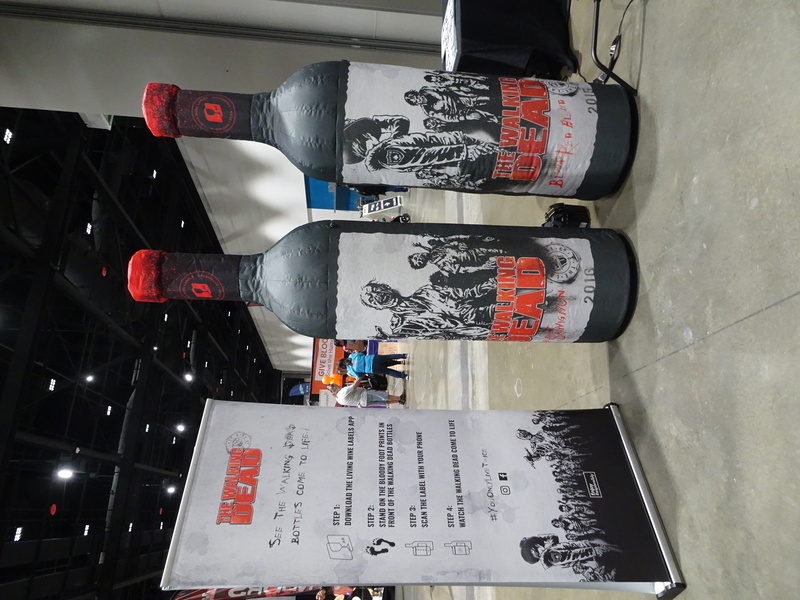 Have you attended Walker Stalker cons? Join the conversation on the FoCC forums! ← Next Week in TV 12/2: Get Ready to Blast off with Syfy’s ‘Nightflyers’ and More!